More than 30 current and former WHL players made their way East this past week as NHL Atlantic Division teams held their annual development camps. Two Rockets were included in those camps. 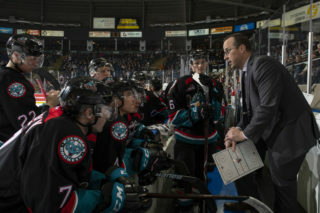 Led by former first round NHL Draft selection, IIHF World Junior Gold Medalist, and Rockets Captain Cal Foote, a total of 32 WHL players and alumni from 17 different WHL clubs attended development camps with the Buffalo Sabres, Detroit Red Wings, Florida Panthers, Montreal Canadiens, Ottawa Senators, Tampa Bay Lightning, and Toronto Maple Leafs. Former Rockets defenceman Devante Stephens was one of the names on the list of the Buffalo Sabres Development Camp. A break-down by team shows the needs that WHL players are looking to fill on their respective clubs. Buffalo has been stocking up on defence through the draft, selecting 11 defencemen over the last three years. Guhle, a second-round pick in 2015, has already played with the Sabres, appearing in 18 games last season, where he recorded five assists. Devante Stephens was drafted in the fifth-round of the same year played last season with the Cincinnati Cyclones of the East Coast Hockey League where he recorded eight assists in 33 games. Swift Current Broncos forward Max Patterson was invited by the Sabres to attend this year’s camp. The 6-foot-4, 200-pound winger is fresh off his team’s successful WHL playoff run that saw them win the Ed Chynoweth Cup for the first time since 1993. The Kamloops, B.C. will get his chance to showcase his skills to the Sabres from Wednesday, June 27 to Saturday, June 30 at the Harborcenter. Here it is – our 2018 #SabresDevCamp roster. After 25 consecutive playoff appearances, the Red Wings have missed the playoffs for two consecutive seasons and have acquired considerable WHL talent at the NHL Draft as a result. Cholowski was the first-round pick of the Red Wings back in 2016. He played his first season in the WHL this year, splitting it between the Prince George Cougars and Portland Winterhawks where he accumulated 66 points (14G-52A) in 69 games. While his offensive abilities were prominent, he was also excellent defensively, recording a plus +/- 29. Zablocki was Detroit’s third-round pick in 2017 and split the past season between three WHL clubs where he scored 31 points (12G-19A) in 65 games. Rasmussen was the Red Wings first selection in the 2017 draft. He served as the captain in Tri-City this past year, posting 59 points (31G-28A). He exploded in the playoffs, recording 33 points (16G-17A) in 14 games. At 6-foot-6, 220 pounds, the Vancouver, B.C. product is an effective player across all areas of the ice. The Florida Panthers have skilled offence and responsible defence; however, they have not been able to get over the hump and advance past the first round of the playoffs in six seasons. They are hoping their pool of prospects will help them achieve this. The Swedish-born Nassen was selected in the third-round of the 2016 NHL Draft. He has since moved to Canada to play in the WHL. Last season he recorded 25 assists and 26 points through 44 games. Patrick Bajkov signed with the Panthers as a free agent in March of this year after scoring 92 points in 67 games to become the Everett Silvertips all-time leading scorer in points and goals. He finished this season with 100 points (33G-67A) in 72 games and added 23 points (14G-9A) in the playoffs. The Panthers also invited two WHL players that had excellent seasons with their respective clubs. Tyler Soy of the Victoria Royals set the same record as Bajkov, becoming the all-time leader in points when he recorded his 265th point, a record that he had been enhancing every game since. The Cloverdale, B.C. native finished his WHL career with 327 points (151G-176A) in 323 games. This leaves the Florida Panthers development camp with two All-Time Point leaders for their respective clubs. In addition to Soy, Dylan MacPherson was also invited, marking a pair of Tigers at the Panthers’ camp. MacPherson has played two seasons in the WHL and has recorded 31 points. The 6-foot-3, 185-pound defenceman is a physical presence but keeps disciplined, receiving only 26 penalty minutes in 118 games. #FlaPanthers announce their 2018 Development Camp roster. 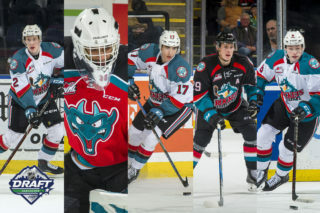 The Montreal Canadiens have turned to the WHL to enhance their blue line, with alumni Shea Weber, Karl Alzner, Noah Juulsen and David Schlemko already on their roster, they have four current WHL impact blue liners attending their development camp. Josh Brook, a second-round selection of the Canadiens in 2017, is coming off another successful campaign with the Moose Jaw Warriors, scoring 32 points (3G-29A) and recording a plus +/- 48 in 45 games. Fleury, taken in the third-round of the 2017 draft, put up 51 points (12G-39A) in 68 games with the Kootenay Ice and Regina Pats. Needing depth at center, the Canadiens also drafted seven centers at this year’s draft, one of which, is Cole Fonstad. Fonstad had an excellent year with Prince Albert, increasing his point total by 47 points. He scored 10 more goals and recorded 37 more assists than the previous year. He remained disciplined, attaining only six penalty minutes in 72 games. If drafting seven centers wasn’t enough, the Canadiens also invited center Ryan Hughes who scored 41 points (17G-24A) in 46 games with Portland last season. In addition to inviting Hughes, the Canadiens also invited left wing Brandon Hagel. Hagel recorded 59 points (18G-41A) in 59 games last season after recording 71 points with 30 goals in 65 games the year before. The Senators have looked to the WHL for skill at all positions. Medicine Hat Tigers goaltender Jordan Hollett was selected in the sixth-round of the 2017 NHL draft. Last season in 36 games, he posted a 3.43 GAA and a .896 SVS%. On defence, the Senators drafted and signed Max Lajoie, who played for the team’s American Hockey League affiliate Belleville Senators last season. Prior to joining Belleville, Lajoie put up 119 points (22G-97A) in 203 career WHL games. Kelly wasn’t drafted by the Senators but did sign with them as a free agent in 2017. Last season Kelly served as the alternate captain of the Prince Albert Raiders and put up 59 points (29G-30A) in 69 games. In addition to their drafted and signed players, the Senators also invited Luka Burzan of the Brandon Wheat Kings. Burzan split the season between Moose Jaw and Brandon last year, where he found his feet in the second half, posting 21 points (9G-12A) in 30 games. During the playoffs he added seven points (5G-2A) in 11 games. As well, former Medicine Hat Tigers and Regina Pats forward Boston Leier attended camp after recently completing his time with the Acadia University Axemen after accessing his WHL Scholarship. The Saskatoon, Sask. product had 114 points (54G-60A) in 111 career U SPORTS regular season games. The Tampa Bay Lightning have an extremely skilled team already with WHL Alumni Brayden Point and Tyler Johnson, but that’s only led to a further influx of talent down south. 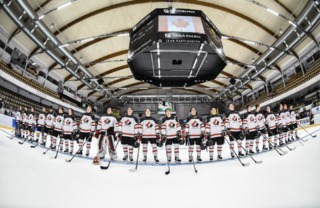 Connor Ingram’s name came to the spotlight when he represented Canada at the IIHF World Junior Championship, but his impressive play started much before that. In 2016-17, Ingram posted a 2.44 GAA and a .927 SVS% in his final season with the Kamloops Blazers. He went on last year to post a 2.33 GAA and .914 with the Syracuse Crunch in the AHL. 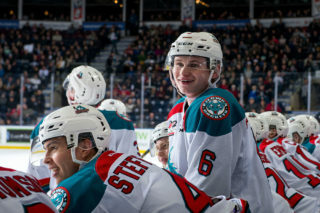 Foote spent last season as the captain for the Kelowna Rockets, where he posted 70 points (19G-51A) in 60 games recording a plus +/- 31. While his playoffs were cut short following a first-round exit, Foote did all he could, putting up six points (1G-5A) in four games. Sosunov traveled from Russia to showcase his game on the smaller North American ice surface and excelled at it. The 6-foot-8, 235-pound defenceman recorded 26 points (7G-19A) in 71 games with a plus +/- 35. The Lightning also invited left wing Jackson Leppard and center Chase Wouters to their camp. Leppard posted 36 points (15G-21A) in 68 games last season after recording only four points the season before. 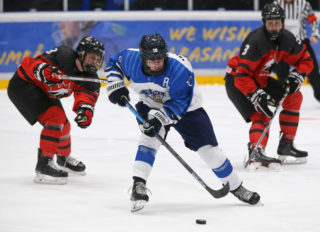 Wouters elevated his game as well, recording 51 points (18G-33A) in 72 games, while receiving the alternate captain honours mid-way through the season. The Maple Leafs have one of the youngest teams in the NHL and they look to add to their young skilled talent through several draftees and invites from the WHL. Filip Kral was selected in the fifth-round by Toronto a few weeks ago after posting 35 points (9G-26A) in 54 games with Spokane. His teammate Eli Zummack will also be attending the camp as an invite. Zummack recorded 41 points (15G-26A) in 58 games, adding five points (2G-3A) in seven playoff appearances. Stotts was selected in the third-round of the 2018 draft. His season really took off after being traded from Swift Current to Calgary. Post trade, he scored 41 points (17G-24A) in 47 games. Pats forward Matt Bradley will also be attending the camp as an invite. The Vancouver, B.C. product posted 79 points (37G-42A) in 72 games with the Regina Pats last season. 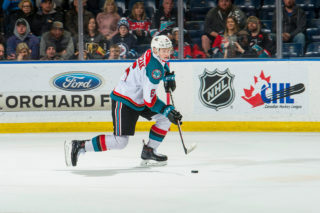 He added four points in five games during the 2018 Mastercard Memorial Cup. The roster for the 2018 @MapleLeafs Development Camp has been announced.